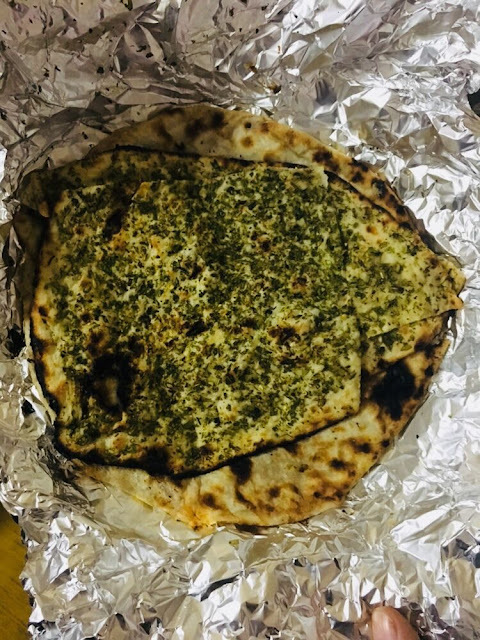 Had tried some delicious North Indian food from Indizza sometime last year and loved it. So when a review session invite for their newly opened Peddar Road outlet cropped up, said yes to it in a flash. Got a huge package of too much food delivered on time by very polite gentleman and 6 of us hogged like there was no tomorrow. Looking at quality and quantity, prices are reasonable. Packaging is secure, food did not spill out of containers and it was all fresh (2 of my friends came late and had food 4 hours after it was delivered, the flavours were good even then). Started off with KEBABS- VEG SEEKH, PANEER PUDINA and both were just okay. Felt dry. Paneer Pudina had overwhelmingly pudian flavour and hardly any paneer could be tasted. Were accompanied with mildly spicy mint dip which was good but next time I think I would stick to tikkas rather than kebabs. Have had paneer tikka from here earlier and they were fantastic. 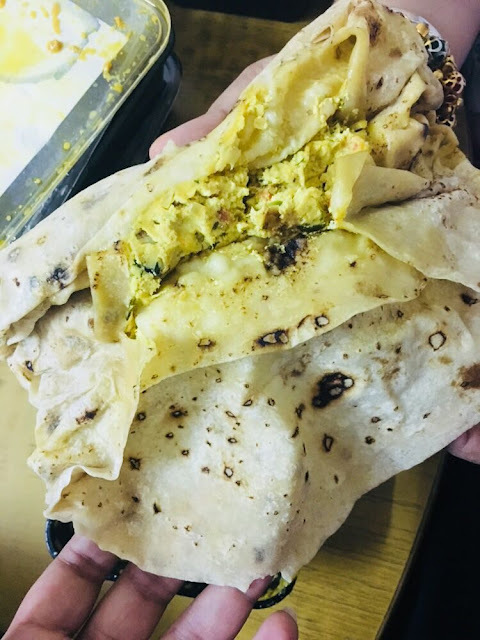 PANEER BHURJI ROLL – STAR DISH of the evening! 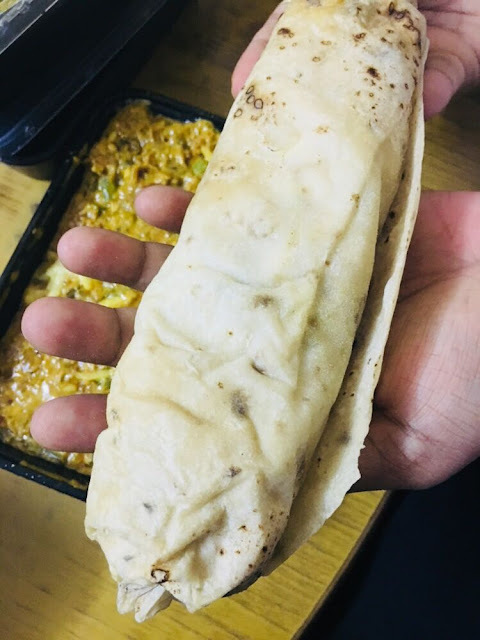 Roomali Roti roll generously stuffed with lip-smacking paneer bhurji, nobody wanted to share this one :P And next time, we are going to order it by the dozen. 1 Roll is enough for a hungry hippo like me, so very reasonably priced too. I am salivating just thinking about it right now, 100% RECOMMENDED. 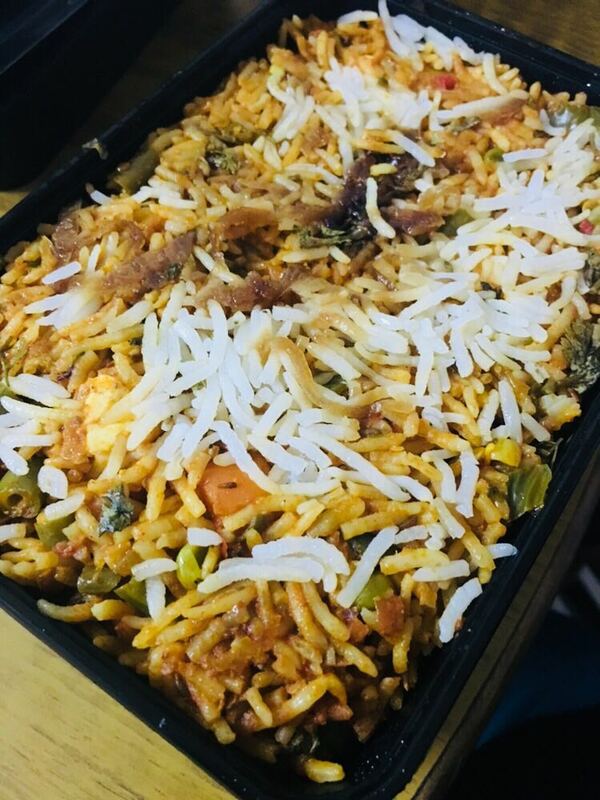 VEG SHAHJANI BIRYANI – Fragrant biryani, no elaichi, no overwhelming kevda essence, a bit too spicy for me but mom loved it, nice proportion of rice, vegetables and spices :) RECOMMENDED. JUNGLEE NAAN, AMRITSARI KULCHA – A bit of let down here. Junglee Naan was okay, went really well with sabzi lababdar but Amritsari Kulcha had tooooooo much saunf! I do not know how the original amritsari kulcha is but I would imagine it would not have this much saunf in it. Kulcha had a mildly spicy veggies stuffing too but the saunf overload in every bite was disappointing. A bit of setback in tikkas and breads department, but the roll, biryani and veg gravy were outstanding, so overall definitely recommended to all foodies. Bon Appetit!